Thailand, the 18th most visited country according to World Tourism rankings, has long been my favorite destination. For me, the grand ancient temples, flocks of tourists, and exotic night markets are what make it a "tourist heaven." However, my recent visit to Thailand left me with the impression that this Southeast Asian country's gentle smile can become a scowl in the face of political unrest. I traveled in Bangkok at the end of November. After visiting the Grand Palace, a must-see tourist attraction, I planned to go to the Vimanmek Museum. I hailed a cab and told the driver where to go. However, the driver refused to take me there, telling me there would be a demonstration there. I called another and got the same answer. Having failed to get there, I checked online to see what was going on. There was indeed a rally near Parliament as well as close to the Vimanmek Museum that day. According to media reports, anti-government protestors were calling for the country's Prime Minister Yingluck Shinawatra, sister of exiled prime minister Thaksin Shinawatra, to step down. The rally was peaceful in its early stages, then police fired tear gas to disperse some of the protestors. The protest group, Pitak Siam, is a royalist group that seeks to have the Shinawatra government ousted and Thai politics frozen for five years. When reading the news, I remembered taking a taxi from the airport to downtown the night before and seeing lines of well-armed police standing on both sides of the road, creating a grim ambiance. It was reported that about 17,000 police were deployed for the rally, and 37 people, including a number of police officers, were injured. I had never before had the feeling that political danger was so close to me. Buddhism is Thailand's primary religion, and more than 90 percent of the population is Buddhist. 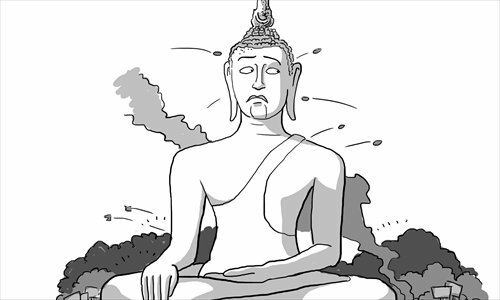 Non-violence is at the heart of Buddhist thinking and behavior. According to the Chinese media, over 1 million Chinese tourists chose Thailand as their holiday destination this year, a 30 percent increase on last year. After all, what tourists pursue is a relaxed and peaceful atmosphere, which Thailand previously prided itself on. One of my acquaintances in Bangkok told me that there were constant protests in the city, to the point where local people had simply become used to them. But tourists are not locals. Their impression of a country comes from their first-hand experience there. Once tainted, it is difficult to change it back. Thailand's domestic political unrest can and will devastate people's public perception of this "peaceful" land. The demonstration I heard of during my trip is the latest of a continuous political crisis since 2006. After former prime minister Thaksin Shinawatra of the Thai Rak Thai (TRT) party government was overthrown in a military coup in 2006, the People Power Party (PPP), seen as the reincarnation of Thaksin's TRT, won the most votes and Samak Sundaravej of the PPP was sworn in as prime minister in 2008. However later that year, opposition protestors began mass anti-government protests calling for Sundaravej's resignation. Since then there have been three prime ministers stepping up and down. The involvement of military and the revolving door of governments have made the country trapped into a non-stop political dilemma, which not only drags down the economic development of the country, but also dims travelers' perceptions of it. Tourists are sensitive to reports of violence and political unrest in holiday destinations. During the Egyptian revolution in early 2011, many countries issued travel warnings and evacuated their citizens there. I was studying in the UK then. Some of my classmates visited Egypt over the Christmas holiday, and were trapped there for a couple of days. They later told me that although it was an exciting experience, they would think twice before returning. Tourism has become a commodity that is valued for providing tranquility, fun, comfort and most importantly, safety. As a result, political scenarios have been counted into this investment. If unrest disturbs this, then travelers' goodwill will rapidly vanish.